As with hardwood and softwood sizes, plywood sizes can be somewhat confusing. Plywood sheets are usually sold as four-feet wide but are occasionally found in two and five-foot widths. Similarly, a plywood sheet's length is commonly eight feet, but some suppliers carry four and 12-foot lengths. Metric sizes are also available. Although it doesn't seem like much, this 1/32" differential between the actual size and the common size can become an issue when working with plywood. For instance, if a woodworker is building a bookshelf where a 3/4" plywood shelf is placed into a dado cut into the shelf standards, there will be a very noticeable 1/32" gap, and the shelf will feel a bit sloppy in the dado. To combat this, the dado should be cut at 23/32" to ensure a proper fit. Are other types of wood affected by this interesting but inconsistent model of measurement? Ironically, yes. Try finding a 2x4 that actually measures two inches by four inches. Instead, if you pull out a tape measure, you'll find that the 2x4 actually measures 1-1/2 inches by 3-1/2 inches in size. You'll find that a 2x6 is similarly one-half inch thinner and narrower than advertised. The one-by material can be even more confusing because the one-half inch rule only applies to one side. For instance, a 1x4 will actually measure 3/4-inch thick by 3-1/2 inches in size. While this rule applies to dimensional lumber, particularly the SPF stock that is prevalent in home centers but often used for home building, it doesn't apply to hardwoods and exotics sold by fine woodworking suppliers. These woods are instead sold by the board-foot, so the actual measurements of the length, width and thickness are used to calculate the cost of each individual board. As such, when buying hardwoods, you may end with two boards that are the exact same size in terms of board-feet, but the boards are obviously very different along the length, width or thickness. Why Isn't a 3/4-Inch Sheet Actually 3/4-Inches Thick? 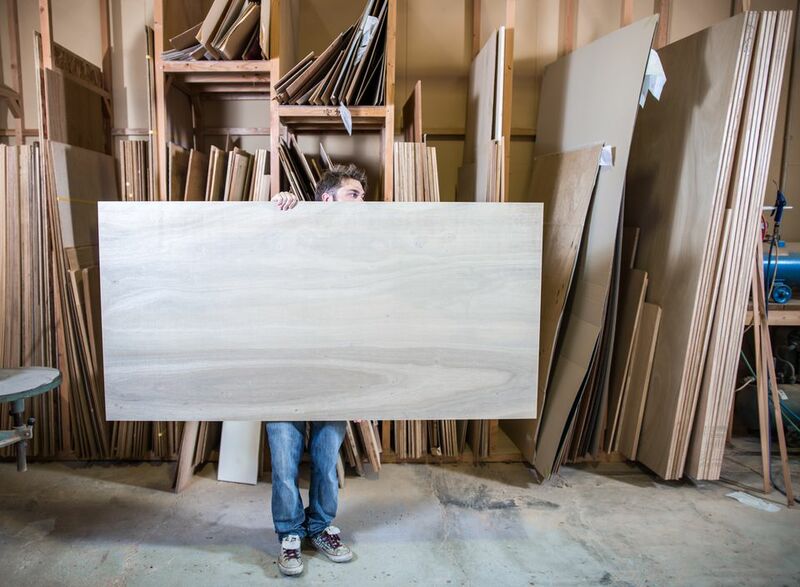 The question most commonly posed when people learn of the variations in wood sizes is, "why can't they just sell a two-inch thick by the four-inch wide board when I buy a 2x4?" There are two answers commonly given. The first is that manufacturers determined that if they shrunk the sizes of each piece slightly, they could get more pieces of sellable material out of each and every tree that they harvest. Over the economies of scale, 1/32-inch in each piece of plywood can add a considerable amount of extra income for the manufacturer. A less cynical answer would be that the reduced sizes actually are adjusted for home building purposes. For instance, a six-inch thick wall can be completed easily using a 5-1/2 inch wide wall stud and a 1/2-inch thick sheet of drywall applied on the face of the framed wall. Buy Surfaced Hardwoods or Surface Them Yourself?